and events for the enrichment of the general public. DIDSBURY ART SHOW & SALE - WHAT A GREAT SHOW!! The Mountain View Arts Society was pleased to host the 8th Annual Art Show & Sale at the Didsbury Art, Travel & Trade Expo in April in Didsbury. Hosted by the Chamber of Commerce, this is the largest trade show between Airdrie and Red Deer in Central Alberta. Our 24 artists joined over 120 exhibitors on three ice surfaces and the community hall with over 4,000 people attending each year. This was another fabulous show featuring so many wonderful local Canadian artists! When visitors entered our gallery, they were greeted by volunteers and artists, and given a "People's Choice" ballot. They walked around the exhibits, enjoying the beautiful pieces of art, then voted for their favourite. The winner was announced at the end of the show on Sunday afternoon. 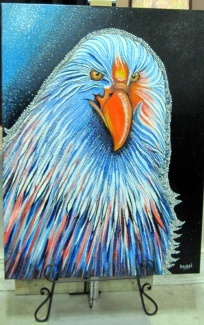 For the 5th year, Didsbury favourite artist was Gayle Kohut. 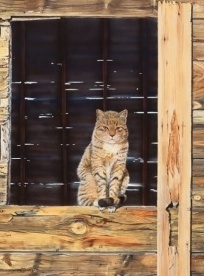 Her painting, "Barn Patrol", received the most votes fromover 900 art ballots. Gayle specializes in watercolor, gouache and acrylic mediums, and says "is my farm life and all its miracles of nature that give me my inspiration for my paintings". 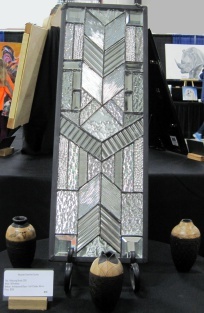 The dates for the 2020 Art Show & Sale will be announced by the Chamber of Commerce later in the year. Please check back. We offer a comfortable space for an "Artist's Window". This popular area sheds light on the artistic process, how artists make art. Each artist has an opportunity to schedule a time when the public can watch them practice their craft, opening a window into the lives of artists as they go about their work. If you have any questions, please contact Merrilee Anthony at 403-512-9888. "A Brush with Art" Spring Art Show and Sale features visual artists and artisans from Mountain View County and the surrounding region. This is a Juried Gallery-style Show. All artists were asked to submit photos representative of their work. LOOK WHO CAME IN 2019!